If we lose one or two teeth we tend to think that it is fine if we replace them at a later point in time as they are not so visible and our other teeth will function instead. Only a few may know that it is not true at all. Even one tooth loss can lead to severe consequences as regards our other teeth. Find out more about the most common risks of having missing teeth. We know that it is not easy to say yes to the treatment even if one knows that it is needed. Our aim is to make you brave when it comes to replacing your missing teeth. Why is it important to have your missing teeth replaced? As the parodontium does not get enough mechanical pressure while chewing on the area of a missing tooth, it starts to recede. It is a serious problem as the parodontium keeps the tooth stable. The recession does not stop at that missing tooth, it extends to other areas putting the health of the other teeth at a risk. After losing a tooth the adjacent teeth start to bend or move to the direction of the missing area. This movement affects the health as the chewing pressure changes, the crown and the root are pressured against the adjacent teeth and their stability in the parodontium decreases. The loss of even a single tooth can greatly affect the eating habits. Patients dealing with these problems tend to eat easily chewable, digestible and multiply processed food. Generally speaking, these kind of food are high in sugar and carbohydrate and are lower in nutritional value than others. Eating softer food makes the masticatory muscles work less so they become weak. Missing teeth can also be visible while keeping the mouth closed. After losing several teeth the face is sunken and the skin is loose. By losing the front incisors the lips move towards the oral cavity. Even a single missing tooth can affect they way of speaking, especially if it is a front tooth as they have a very important role in voice-production. Lisping is very common among these people. The most common reason for losing teeth is parodontium disease. Without proper dental care the plaque becomes a tartar on the teeth. The tartar and the bacteria it contains reach under the gum. Besides causing damage to the tooth itself, it causes inflammation and infection. This infection makes the bone recede result in tooth loss. A simple issue as neglecting dental care can lead to serious consequences. Would you like to find out how to maintain a good dental hygiene? You can read it in one of our previous blogs! Do visit an implantologist! The most efficient way to have the missing teeth replaced is by receiving dental implants. Dental implants function like the natural teeth (as opposed to bridges without implants where the adjacent teeth are the teeth abutments and they lead the chewing pressure to the inside of the parodontium so this pressure is still not on the missing area). The implant part - being aligned to the root of the natural teeth - is stabilized in the bone while the crown part looks almost the same as a natural crown (in color, form and surface too). This is one of the most common question regarding implants. If you would like to have only one tooth replaced you need one implant. In the case of more missing teeth you do not need as many implants as the number of missing teeth you have. When there is only one or two teeth are missing in line on the upper or lower jaw. In these cases the patient needs as many implants as the number of missing teeth he/she has - be it adjacent or far away from each other. With implantation filing down of the adjacent teeth can be avoided and all of the parodontium can have a balanced chewing pressure so that any recession can be avoided. If you would like to find out more about the procedure of the treatment, please click here! This is the case when we would like to have 3 or more adjacent missing teeth replaced with implants. 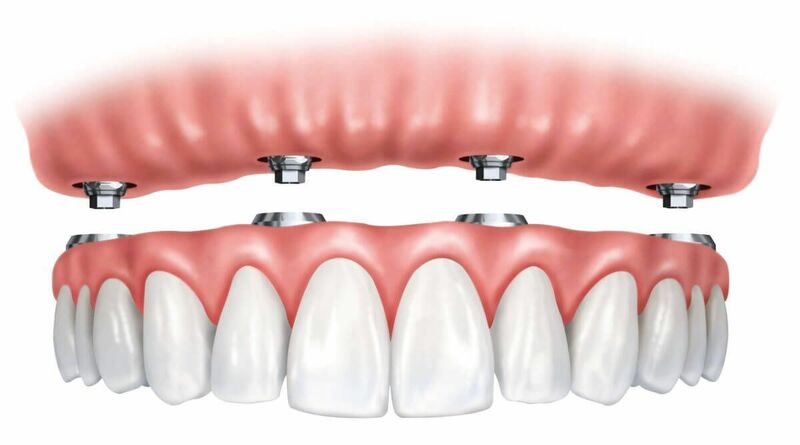 depending on the number of the missing teeth, two or more implants hold the bridge that replaces the natural teeth. The filing down of the natural teeth can be avoided as the abutment teeth for the bridge will be the implants. If we need more replacements it is advisable to have another implant in the middle of the missing area so that the bridge can have a stable foundation and the chewing pressure will be balanced. As opposed to dentures, this is a long term, stable solution for the patients. Sometimes a whole set of teeth are to be replaced. Generally speaking, 6-8 implants are enough for a stable foundation to a whole set of bridge depending on the thickness and structure of the bone and size of the jaw . As opposed to dentures, a bridge with fixed implants are a more comfortable and a more stable solution for the patients. Due to their stability speaking, smiling, laughing and eating are not problems anymore. No wonder this solution is getting more and more popular in dentistry. The type of implant the implantologists use depends on the thickness and structure of the bone. If the bone structure is good for the immediate absorption of the implants conventional implants are to be used. Conventional implants are also a good option in the case of a mild bone recession. In this case the implantologist strengthens the bone (bone graft or sinus lift) before the implantation. In the case of a severe bone loss denture were the only solution. Today, thanks to the revolutionary new implant family (Bi-cortical implants), implantation is possible without the need of a bone graft or sinus lift.